The Medically Complex Care team at St. Peter’s Hospital provides care for patients who have multiple or complex medical needs and functional challenges as the result of any degenerative disease, acute injury, stroke or neurological condition such as Parkinson’s disease, Multiple Sclerosis (MS) or Amyotrophic Lateral Sclerosis (ALS). Our delivery of care is patient-focused and provided in strong partnerships with patients, families and significant others. We are committed to enhancing quality of life for our patients. Patients admitted to Medically Complex Services will have complex needs that require comprehensive interventions by a team of experts. Patients suitable for the program need preventative and clinical management of a combination of symptoms and conditions, which may include, but are not limited to: swallowing problems, enteral feeding, wound care, tracheostomy care, suprapubic catheters, seating/mobility issues. The team is focused on helping patients achieve their goals, whether that is returning home or transferring to another facility that will meet their ongoing needs. The inpatient unit provides care for adult patients of all ages with a wide range of medical diagnoses. Our delivery of care is patient focused and provided in strong partnerships with patients and families. We are committed to the enhancement of quality of life for our patients and the continuous improvement of quality care. 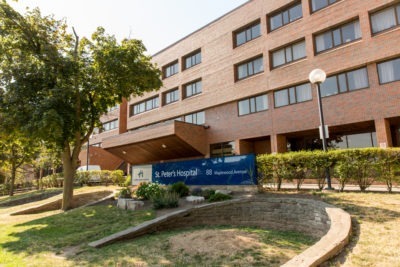 For information about referring a patient to the Medically Complex Service, please contact the St. Peter’s Hospital admitting department at 905-521-2100 ext. 12300.